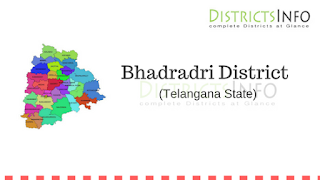 Bhadradri district with Mandals: Bhadrachalam / Bhadradri district has been carved out from the existing Khammam district in Telangana state. Proposed Bhadrachalam district has an approximate area of 8297.80 square km. Bhadradri Kothagudem district is a district in the eastern region of the Indian state of Telangana. 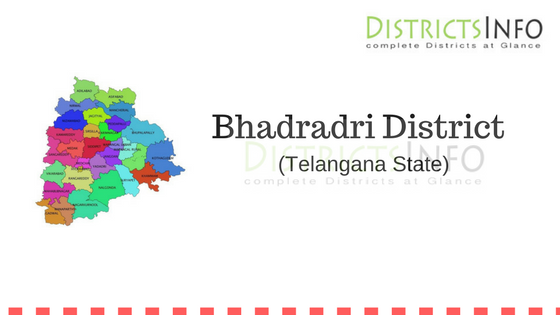 Bhadradri is a new district in a new state Telangana which has 31 districts. And as we all know that this is a new state in India, so it needs to be taken care to be a great district in Telangana state. The town of Kothagudem is the district headquarters. It was a part of the Khammam district prior to the reorganization of districts in the state. The district is spread over an area of 8,951 square kilometers (3,456 sq. mi). The district is bounded on the north and north east by Bijapur and Sukma districts of Chhattisgarh state, on the east by East Godavari district, on south and southeast by Khammam District and West Godavari district, on West by Mahabubabad district and on the northwest by Jayashankar district. As of 2011 Census of India, Bhadradri has a population of 1,304,811. The district will have two revenue divisions of Bhadrachalam and Kothagudem and is sub-divided into 23 mandals. Bhadradri has potential to be one of the fully developed district in Telangana. But as we all know that Telangana is a new state, so it may take some time to work properly. It has been a part of Andhra Pradesh earlier, so almost many of the developments have been done already here. Also, South Indian states have a great literacy rate, so people here know the meaning of development and how to achieve this. Bhadradri has all the meaningful resources to be a developed districts by all means. Transportation system is awesome here. Bus transportation is great here. Also, we can say that as it is a new state and smaller one now. The government can think more accurately about all the 31 districts including Bhadradri.